For those with vision impairment, contact lenses offer an easy and affordable solution to seeing clearly. 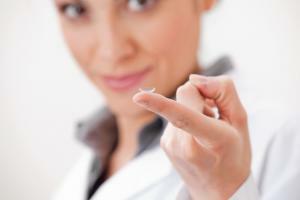 At Carolina Vision Care, we offer a variety of contact lens services for your convenience. When you come to our office, Dr. Thomas McIntosh will perform a contact lens evaluation and answer all of your questions. A contact lens exam is separate from a routine eye exam. During a contact lens evaluation, Dr. McIntosh will investigate the health of your eye to determine whether or not you are a candidate for contact lenses. In particular, he focuses on the conjunctiva, eyelids, and cornea as these can affect the fit of the lens. Dr. McIntosh then looks at the fit of the contact lens on the eye to make sure it aligns correctly with the lids and cornea. Once everything fits well, he will check your vision to make sure you can see correctly. A contact lens prescription is different than a glasses prescription. While a contact prescription is based off of the strength of your glasses, it also accounts for your corneal curvature and health. We determine your contacts prescription during your contact lens exam. Why Is It a Separate Process? Contact lens examinations are separate from a comprehensive eye exam because of the additional testing and expertise that they require. Additionally, many insurances require us to charge it as a separate fee. Regardless of your eye condition, our Greenville, NC optometrist Dr. Thomas McIntosh, OD can help you find contact lenses that are a perfect fit. They will recommend the proper lens depending on your specific situation. There are several different kinds of lens shapes that are meant to treat different eye disorders. We will determine the correct size for your eye to give you optimum comfort and function. Once we determine your lens shape during your contact lenses exam, it is time to choose what kind of lenses you want. There are several different types to choose from, again depending on your eye condition. Colored, Prosthetic, or Special-Effect Lenses are a fun way to give your iris an enhanced or new eye color. UV-inhibiting Lenses act like sunglasses for your cornea, helping to prevent cataracts and other sun-related eye issues. Scleral Lenses are gas permeable and have a large diameter for treating keratoconus and presbyopia. Dry Eye Lenses help to reduce dry eyes that are typically caused by contacts by allowing your eye to breathe more freely. Corrective Lenses are the standard lenses used to fix farsightedness, astigmatism, and nearsightedness.